Motherwell slipped to eleventh in the table with a disappointing 3-1 defeat at Firhill this afternoon. The Jags were largely comfortable after Stuart Bannigan gave them a 16th-minute lead, although the game might have been different had Henrik Ojamaa’s early header been a inches lower rather than hitting the underside of the bar. O’Donnell fed Kris Doolan for the second after the break and took advantage of a absent Motherwell defence to score a late clincher on the counter-attack. Motherwell had briefly threatened a comeback following a sensational 35-yard strike from substitute Lionel Ainsworth, but they were again lacking in confidence as an attacking side, despite signs that Ojamaa is regaining his sharpness. Both sides rang the changes as they looked to bounce back from heavy defeats, Thistle at Kilmarnock and Motherwell against Hamilton. Thistle made three switches, with one enforced after Kallum Higginbotham was forced to undergo knee surgery. O’Donnell, James Craigen and Christie Elliott came in. Steven Hammell made his first league appearance of the season for Motherwell following a groin tear while Keith Lasley, Mark O’Brien and Iain Vigurs returned from injury too and both John Sutton and Josh Law were recalled. Motherwell came close to the lead in the 11th minute when Law made a loose ball his and burst to the bye-line where he crossed to the near post. Henrik Ojamaa got his head to it but saw his effort crash off the bar and bounce down off the line, with goalkeeper Scott Fox getting a decisive touch. A goal soon came at the other end though. Steven Lawless had not long shot just wide following good skill when he collected the ball in the centre circle after Motherwell right-back Fraser Kerr’s run down the wing was thwarted. Lawless exploited the space by playing the ball inside Vigurs into the path of Bannigan, who streaked away from his marker and guided a shot high into the net past Dan Twardzik. Twardzik held a 20-yard volley from Doolan before Motherwell had a couple of half-chances from corners, Fox saving from Sutton’s close-range header before McManus sent a free header well over from a difficult angle. Thistle were posing sporadic threats and an ambitious Lawless snap-shot flew wide before Elliott shot straight at Twardzik. Motherwell pressed before half-time but the best effort they could muster saw Law curl just over from 20 yards. There was little sign of a Motherwell comeback in the early stages of the second half and Stuart McCall brought on Ainsworth for Vigurs on the right wing 11 minutes in. But Thistle’s second goal followed from their right wing in the 62nd minute. O’Donnell got on to Conrad Balatoni’s ball and held off Law before getting to the bye-line and cutting it back for Doolan, who got in front of O’Brien to fire a shot into the roof of the net from 12 yards. Law soon made way for Lee Erwin but Thistle came close again when Twardzik beat away Craigen’s near-post strike. The Jags looked completely in control but there was nothing any team could have done about Ainsworth’s 72nd-minute strike. Motherwell won the ball back in midfield and Erwin fed Ainsworth almost 40 yards out. The winger took one touch and fired a magnificent strike across Fox and right in the top corner. Ainsworth threatened again moments later when Fox turned his 20-yard strike past his near post. Suddenly Thistle were under pressure but Motherwell were undone on the break in the 82nd minute after the hosts cleared a corner. Nathan Eccleston, on moments earlier for Doolan, got to the ball just in front of Stuart Carswell on the touchline 15 yards inside his own half. But Motherwell sub Zaine Francis-Angol charged forward from his position on the halfway line to leave Twardzik unprotected and Eccleston managed to turn the ball forward for O’Donnell to run on to. The right-back ran from his own half unchallenged and kept his composure to slot through the legs of Twardzik, and Fox saved well from Erwin in injury-time to complete the 3-1 triumph. “We touched on it last week, we lost Dan and Kallum last week at Kilmarnock at half-time and I thought other players have got to take responsibility as a team. “Obviously when you are not winning games it’s a worry. I’ve been through it as a player and a coach and there’s no hiding place. You have to stand up and be counted. “I don’t think it was a lack of desire or effort, they scored at the right times and took their opportunities. “Of course it’s a concern when you are losing games and near the bottom of the table. I think you could say for the last three and a half years we have punched above our weight, I think certainly at this moment we are punching below our weight. It was a quiet one for ‘Well ladies last weekend, with only the Under 9s and under 11s in action. The Under 9s were at K Park taking part in a tournament with five other teams. A confident and clinical first game saw the girls beat Gartcairn 3-0. Their second match was a much tougher test, but the girls managed to sneak a win, beating East Kilbride 4-3. The next two games saw defeat for the young Wells girls, losing 5-2 to a more experienced East Kilbride team and losing 1-0 to East Kilbride Thistle, however a 1-0 win to Rossvale added to their win tally. The Under 11s won 4-1 on Saturday against Gartcairn. They played some fantastic football and demonstrated just how the old ‘give and go’ technique should be played. A solid win for the girls with only one wee flaw in the ‘Well defence, as fatigue saw an unfortunate goal lost in the closing stages of the game. • Under 9s vs K Park Festival: Sat 4th October 2014, K Park, East Kilbride, 12noon – 1.30pm. • Under 15s have no game this weekend due to the Scottish Cup Semi Final. 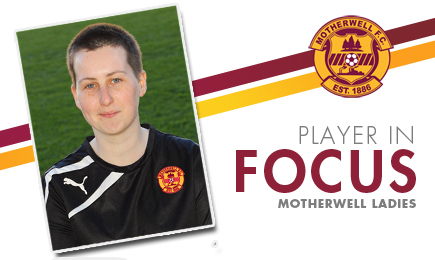 • Motherwell Ladies FC v Bishopton: Sunday 5th October, Daisy Park (Cathedral Primary), 12noon KO. With a vast range of player pathway age groups ever growing at Motherwell FC, I thought I would see where it all starts at the club. In this week’s focus I had the privilege of speaking with Lead Coach of the Under 9’s and 11’s, Laura Day. What was your playing position? I started as striker but ended up working my way back to Right Back. Who are the previous clubs you have played for? East Kilbride, Motherwell, Glasgow Girls, Scotland Development and a few games for both Rangers and Celtic. What age group do you coach? The Under 9s and Under 11s and help at the senior Ladies team. How long have you coached them for? I have coached the younger age groups since I arrived at Motherwell nearly two years ago, and actually started the Ladies team after only a few months of being part of Motherwell FC. What made you decide you wanted to coach football? I wanted to help improve the number of girls participating in football and to help encourage them to take their talent as far as possible. What inspires you to coach football? To see the difference and effect I can have on someone, not only as a footballer, but as a person in general, is an amazing feeling. My key word is confidence and it makes me happy to see the girls all enjoying themselves and positively interacting with each other. How did you get involved at Motherwell? I just tried my luck and emailed Motherwell FC after a spell at Glasgow City and met (MFC Community Trust General Manager) Charlie Bennett for a coffee. After hearing his plans for the club and us having the same views on girls’ football, I had no doubts I wanted to be a part of the club. How does it feel to be a part of Motherwell FC? It’s amazing! Very demanding at times as we have a quality set up and are always attracting new players for all age groups. But we also have a great bunch of coaches, who are all very knowledgeable, so it’s always good to learn new ideas from them and see the club growing in numbers. What do you and your team do to prepare for each game? We gather round the tactics board to discuss our aims for the upcoming match. Between fellow coach Pamela Liddell and I, we choose one specific area for the girls to work on during the game and discuss how to get success in that area. We then do a warm up and some stretching before a wee ‘cuddle’ to gather our confidence. Who’s coaching career do you admire the most? I would say Shelley Kerr. She’s achieved so much and is now the only female coach to go on to coach men’s football. Would you trade football to coach in any other sport? You couldn’t pay me enough to leave football. It’s my life and what I always wanted to do. Is it hard to juggle coaching with other commitments? Sometimes it is difficult to manage my college course with coaching, but I have great team around me who always help out and always keep me focussed. Big shout out needs to go to Linda Gibson for that one! Thanks buddy. In your opinion, what’s been your favourite coaching moment? It has got to be when our Under 11s won their first game after the Performance Centre only been up and running for just one week. The girls and coaches walked off the pitch to a big cheer from our fans, so it was a great atmosphere and a great piece of history for the club. It’s a memory that will last a lifetime. What do you love most about coaching at Motherwell? The girls I coach are always looking to improve, regardless of what they are learning. They turn up for football with a smile on their face and are always focussed which makes my job easier. What makes a great football player? I think a lot of key areas make a great football player but if I was to narrow it down I would say they would need to be full of confidence in their own ability and also have a good mentality to get the head down and strive to learn new things. What do you hope to achieve with your team over the next few seasons? For me it’s quite simple, I want them to enjoy their football and enjoy winning games. From doing what we practise in training and working together then we will be challenging for the league in March …and winning it! Stuart McCall is targeting more goals as his side aims to bounce back from last week’s derby disappointment. The Steelmen have only netted four times domestically this campaign, resulting in two wins from eight matches. It’s been a frustrating start, but one McCall is hoping to rectify when he faces a tough trip to Firhill. He said: ”The disappointing thing is we have only scored one goal at home. “In saying that, we had five outstanding chances at the start of the second half against Hamilton. “It’s been like that since I’ve been here; the home form up until Christmas, then we seem to go on a good run. Our away performances have been better and we need to put in another good one. “Big Sutty [John Sutton] has managed to get a couple of goals, Vigs [Iain Vigurs] has chipped in with one and Lawsy [Josh Law] has a couple. “We’ve not been scoring but in the last two games we have been creating chances. The returning Stevie Hammell says ‘Well will need to up their game significantly to get a result at Firhill tomorrow. The Steelmen have made a stuttering start to the new campaign, although recent results at Dingwall and Celtic Park gave some cause for optimism before a hugely disappointing derby double whammy by Hamilton. The experienced left-back has been a frustrated spectator, watching on from the stand after tearing a muscle in the European match back in July. Finally fit and back in contention, the former Scotland International is in the squad for tomorrow’s match against the Jags and he knows what to expect. Asked if he is confident ‘Well can turn their fortures around, the 32-year old said: “Of course we can. It’s not gone the way we want it to go so far, but if we can put a little run together and keep up with the group in front of us, then we’re right amongst it again. “We’ve got good characters and we’ve bounced back before, but it’s okay me sitting here saying it and us training hard through the week. When it comes to a Saturday that’s all the fans want to see and that’s when we need to do it. “In saying that, we’re expecting a tough one tomorrow. I’ve watched Thistle a few times and they’ve impressed me, and they’ll probably feel some of the matches they’ve lost they’ve been hard done to. All you need to do is vote for the ‘Well player you think has been the stand-out performer for September and you could be chosen at random to congratulate our star man in person. After a ‘free week’, the Under 20s will return to action next Tuesday with a home match against Inverness CT at Fir Park. After three consecutive wins over Hearts, Dunfermline and Hibernian, the young Steelmen have been forced to sit it out for the past two weeks with no game. They have, however, played and won in bounce games against both Dunfermline (again) and a US Soccer Academy side during the break. Johansson’s men currently sit seventh in the seventeen-team SPFL Development League table, just four points from the summit. They do, however, have games in hand over some of the teams above them and will want to maintain their run and keep tabs with teams at the top. They will face a difficult task against Inverness, who themselves will go into the game on the back of a hard-fought 3-2 win over last season’s high-flyers Hibs. Under 20s boss Johansson said: “When you are on a little run, you just want games to come thick and fast, so it has been frustrating to not have played competitively since September 16th. “We’ve kept things ticking over with a couple of bounce matches, and we are already chomping at the bit to get back into it next Tuesday. The match against Inverness will take place next Tuesday (7th October) at Fir Park Stadium. Kick off is 6pm. The MFC Community Trust will again be offering young people between the ages of 5 and 15 the opportunity to experience life as a pro footballer. The popular Academy Experience programme returns again during the October Week Holiday period. The five-day programme – 13th-17th October – costs just £50 for the week or £11 per day. Players should bring their own packed lunch, and appropriate footwear and clothing – and a change to allow for inclement weather. The MFC Community Trust has extended its sporting activities to Basketball with the formation of the ‘Motherwell Steelmen’. It’s not often that a professional football team helps to a create basketball team, but that’s exactly what Motherwell Football Club has achieved through its Community Trust, thanks to a forward-thinking and unique development in partnership with Braidhurst Community Sports Hub. The MFC Community Trust has been involved in the development of the Sports Hub over the last couple of years and was really pleased to meet with pupils of Braidhurst High to identify sports young people can take part in and, indeed, deliver to younger people in the area as coaches. 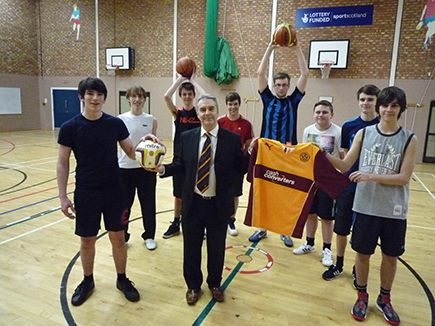 The Trust was so impressed by the commitment of the young people to develop Basketball as one of these sports, they offered to support the project by providing basketball kit and in return the team will play in local leagues as the “Motherwell Steelmen”. Commenting on this initiative Charlie Bennett, General Manager of the Community Trust said: “This is a great initiative for us. We want more people playing sport, leading healthier lifestyles, and encouraging younger children to get involved. Crucially we also want more people becoming part of the Motherwell FC family and the Motherwell Steelmen will help us achieve this. “We were greatly impressed by the enthusiasm of the young people and by Stuart Farr, Senior Development Officer (Community Sports Hubs) with North Lanarkshire Council, who has facilitated the initiative and we really wanted to get involved and help them get started. If you would like more information on the Motherwell Steelmen, or the Braidhurst Community Sports Hub, please call Stuart on 07739 654 597. MFC Community Trust were delighted to welcome Victoria Park School from Carluke along to the stadium for a visit to the ‘Reading Garden’ last week. Victoria Park is a special school catering for children and young people aged between 3 and 18 with additional support needs including complex learning difficulties, physical difficulties, sensory impairment and autistic spectrum disorders. The youngsters came along and gave a helping hand in the garden, which is located between the Phil O’Donnell and the Maxim Office Park Stands, removing some weeds and even bringing some flowers to plant themselves. Teacher Alison Hawthorn also added: “The gardening project between Motherwell FC and ourselves has been a great success so far. Mark O’Brien got his initial taste of first-team football months after leaving his home in the Republic of Ireland to move to Derby at the age of 15. The defender’s determination to keep experiencing the same thrill of playing at the top level has been undiminished despite suffering a series of blows before his 21st birthday that the vast majority of footballers do not experience in a lifetime. The centre-back had heart surgery around the time of his 17th birthday and has since had two major knee operations. After not making a first-team appearance since February 2013, O’Brien was aiming to come to Motherwell to revive his career. The loan deal almost fell through when he suffered an ankle injury during a pre-season training camp. But Motherwell manager Stuart McCall waited for him to regain his fitness and the 21-year-old has shown his gratitude by playing his part in Motherwell’s Scottish Premiership revival in recent weeks. “I’ve loved every minute of it,” he said. “I think because I’d not played in a first team for nearly a year, it just felt good to be coming up here knowing I had a chance to play first-team football. Some of O’Brien’s Derby teammates, such as former Kilmarnock midfielder Craig Bryson and former Dundee United striker Johnny Russell, had told him Motherwell was the perfect club to rebuild his career. But his willingness to move to Fir Park was strengthened when McCall waited for him to regain his fitness following the minor setback. “When I was away in Austria with Derby we were training and the second last day I rolled my ankle,” he said. “It could have been a lot worse, we expected it to be a lot worse. When it happened I was gutted because I was told I had torn three ligaments in my ankle because of the swelling and the bruising. But when I found out it wasn’t as bad, it was a weight off my shoulders. “I had done all my training, got over my injury from the year before, and I was looking forward to a fresh start at Motherwell. When that happened I was really annoyed, but I was really happy when it was only a couple of weeks of treatment. Because it wasn’t that bad, the manager here stayed patient and let me do my rehab at Derby until I was ready to come up. Not many managers would. A lot of managers get someone else in if it’s not on there and then. “I felt privileged that he waited. The fact he waited for me made my mind up a lot clearer than it was at the start. The ankle injury was nothing compared to what O’Brien had overcome in the past – having surgery to cure cruciate ligament damage and then a knee joint problem. “The aim is to put all that in the past,” he said. “I’ve done that with the majority of my injuries – put them in the past and get back playing to the standards I was beforehand and get my fitness back. It was frustrating because obviously I’ve had my fair share. Dublin-born O’Brien’s ambition to make a career in the game saw him leave home at an early age. ” When I came over at just fifteen, I moved straight into digs,” he said. “It was strange at first but because I loved football so much it took the homesickness away. I just enjoyed every single day kicking a ball around at training. It was in that same season when I turned 16 that I made my first-team debut. “So from moving over at the age of 15, playing for a Sunday league team, to playing for a first team in a big stadium in the same season, it was an eye-opener to what I wanted to do and aim for. “Because I got a taste of it at a young age, it was tough when I got injured for the first time, and then got back from that and got injured again. “But I knew what I was trying to get myself back for because I had first team when I was young. So whatever injury came around I knew what I was aiming to get back to. I was always driven and never let anything knock me back. The former Republic of Ireland youth international’s resolve to come through those injuries was never in question, given he had come through an operation to fix a heart defect that was picked up in a routine check in November 2009. “At the time when it happened we didn’t know if I was going to play football again or not,” he said. O’Brien was eager to make sure his most recent return from injury was a lasting one, and knew he would have to leave Derby, temporarily at least, for the sake of his career, after realising he would not immediately be in Steve McClaren’s first-team plans. “I’d say I was fit from November until the end of the season,” he said. “But there was a new manager and I wanted to prove that I could play the way he wants to play, and be more cautious about getting fitness and getting my knee sorted, rather than getting thrown in at the deep end to playing. I took last season as a stepping-stone to going out on loan this year. “For myself I just wanted to get out on loan and play games, and get my name back out there and that I’m back fit. My career was coming to a stop-start, where I would play a couple of games and pick up an injury, play a couple of games and pick up an injury. Now I’m set on playing week after week and on the way doing well for Motherwell, and hopefully we can start climbing back up the table. “Before I came up here I was just thinking about taking it for six months, getting my fitness, getting games, getting experience, and when it comes to January, if everything has gone well, hopefully Motherwell can be an option because I’m enjoying every single minute of it. “Last Sunday at Celtic Park was the perfect example – everyone worked hard for each other, the subs, the people who travelled, the 11 who were on the pitch. Everyone worked hard for each other and the manager. Day in, day out in training everyone has a laugh but when we need to work hard we all get our heads down. “There’s a great balance of when to have a laugh and when to be serious. The lads have been brilliant and it’s helped me settle in a lot easier. O’Brien is at Fir Park until January but he is open to the possibility of extending his stay. “I’ve not really heard anything from Derby since I’ve been here,” he said. “That’s maybe because it’s early doors but they have got to get on with their season and I have to get on with my career. “If Derby want to phone up and find out how I’m doing, all well and good. If they are finding out from other people, all well and good. But if not I have to look out for myself and do well for Motherwell. “If there’s not much there for me at Derby I have to put it to one side and start focusing on what I want to do myself and make a career for myself. I’ve been at Derby for a long time and coming to Motherwell has made me think of more options other than just at Pride Park.